I’ve been working with a patient who was a paratrooper in the Korean War. Impressive, in my opinion, for what he did for this country but also for the idea that he jumped out of a plane. More than once! Some of you may be total adrenaline junkies, and I will admit that I went through a phase where I actually jumped out of a plane. Of course I was strapped to an experienced jumper and the only thing that I had to worry about was enjoying the sights- not if someone was shooting at me while doing so. But once was definitely enough for me. Randomly I found once the parachute actually opened that was when I felt the most sick. I think it must have been all the adrenaline coursing through my body finally finding my stomach, but the actual free fall, all 8 seconds of it, was much more enjoyable than floating under the canopy. I think it was about two months after that jump when it hit me how incredibly crazy jumping out of a plane was. I was with my family enjoying a simple moment of being an aunt, and it just sort of popped into my head how many little things could have gone wrong with that one moment. Of course so many things can go wrong at any moment in time, but I was actually standing up waving my arms and shouting, “Me! Me!” at lining up all those moments. Would I do it again? Nope! I have too much to live for to take such a risk. I’ll get my adrenaline rush by riding my bike in crazy traffic and watching things blow up in movies. And for the most part, movies can take care of that adrenaline rush. Right? I’m one of those people who has a hard time watching ice skating competitions or gymnastic events because my blood pressure seems to sky rocket with nerves for the potential disaster of someone making a mistake and having it be viewed on national TV. But in the movies, it all seems so safe and controlled. Doesn’t it? But what about that behind the scenes aspect? Those individuals who make that adrenaline rush on screen possible. The actors and actresses making that movie magic. And probably even more importantly, the stunt performers making those moments amazing! How many of us think about those behind the scenes lives of actors and actresses or any other personnel of Hollywood? Sure I’m entertained by reading the headlines of the tabloids while standing in line to pay for groceries, seeing which one sounds more outrageous and not believing any of them. But can all these Hollywood types really find love? Can they take the ultimate adrenaline rush and fall in love? I would like to think so. And if it is anything like some of our amazing lesfic authors have portrayed it absolutely is! 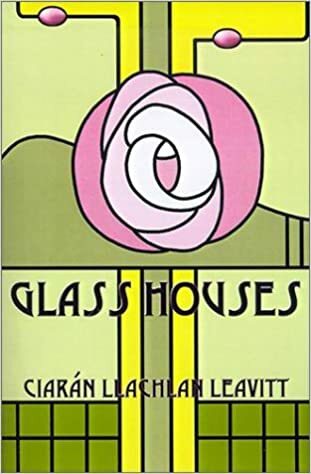 My first Hollywood lesfic was Ciaran Llachlan Leavitt’s Glass Houses. A story set before anyone was really out in Hollywood and finding any kind of success. Yes, Ellen had announced her relationship with a woman, but it seemed like it took years before that no longer created the enormous roadblock in her career. What Glass Houses created was a wonderful story of how two strong women could develop a friendship that leads into a romance amidst all the drama and struggles of making it in Hollywood. A time frame even before the Ellen turning point was portrayed in Chris Paynter’s Survived by Her Longtime Companion. A time when just a hint of such a relationship could blacklist an actor or actress. Can you imagine what it would be like to have everyone want to know about you, your life, your relationships, watch your marriages fall apart just because you are on the big screen, but what you can’t tell anyone is that the person that holds your heart and rocks your world is a woman? And if such news came about it would ruin your career but the entire world would hear about it, because, well, you’re famous? A sacrifice for everyone involved. 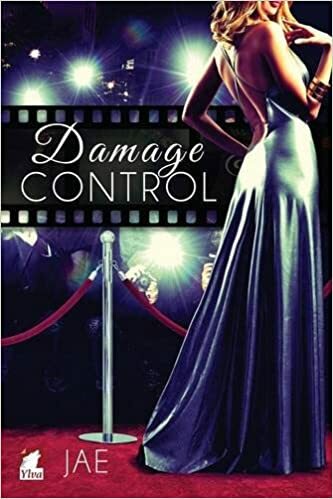 I’ve enjoyed stories that explore ALL of Hollywood as well and our lesfic authors have offered up some wonderful looks into the publicity aspect with Jae’s Damage Control where Grace and Lauren face with all the issues that plague the tabloids. The characters are so wonderful I could totally believe that Grace was real and the story had me lost in the world of Hollywood. But the rough times aren’t just for the celebrities in the spotlights. It seems like it would be tough for anyone trying to make it to the big screen. Continuing with Jae’s Hollywood series, that is exactly Amanda’s story from Departure From the Script. 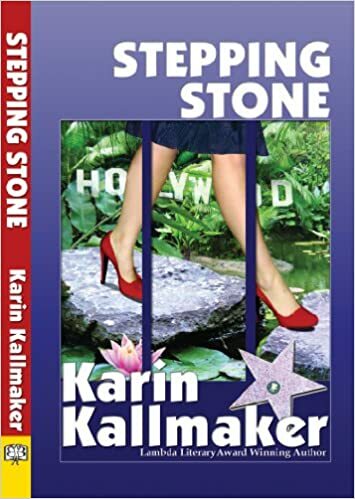 But it is also Gail Welles’ story in Karin Kallmaker’s Stepping Stones. A story where we also get to see all the money aspects of putting on a production worthy of the big screen. Then the stories that keep me living the adrenaline-rush-vicariously are the ones with all those amazingly crazy stunt performers. Rounding out Jae’s Hollywood series is Just Physical that has Crash tumbling, diving, falling, and burning all over the place. Crazy! I can’t even imagine why someone would want to do that but Crash is amazing at it! 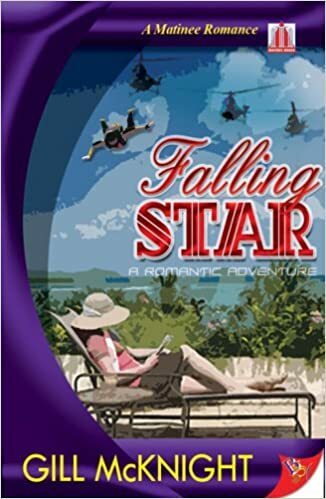 As is Gill McKnight’s Gin Ito in Falling Star! I mean her first scene is falling out of a helicopter into the ocean! Professionals to the utmost, but jeepers I couldn’t imagine doing what they do! Yep! Our lesfic authors are amazing at bringing Hollywood to life! All aspects of it too. What are some of your favorite Hollywood lesfic stories and what aspect of Tinsel Town does it capture? I know there are more out there! 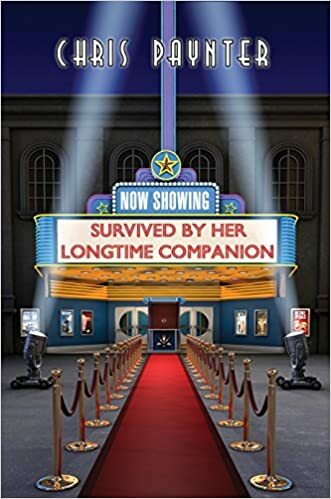 Another great author who writes books about Hollywood is Lisa Girolami. She has several books that are centered around the entertainment industry. I was thinking that the name sounded familiar! I’ve only read a couple of her stories but I enjoyed them. I would love to hear which of your entertainment industry stories you enjoyed and I’ll add them to my wish list! Thanks for reading Mary Buchanan!! SBHLC is an awesome story so it deserves to be mentioned. The plane thing IS crazy. I still shake my head over how crazy it was!! Great blog as usual, Erin. Another great read which showed the dark side of McCarthy era Hollywood is Robbi McCoy’s The Farmer’s Daughter. Mutt’s muse and future partner Annie marries a gay actor so they both can continue their successful movie careers without the prying eyes of the press and the public. Mutt and Annie are forced to keep their love hidden. Such a beautiful book. Just reading the blurb the story sounds intriguing. Can’t tell how many of the bum times there are though. Hopefully it has a happy ending. Thanks for reading! They might not jump out of planes but the characters in these two Hollywood themed novels were still full value. Constance Darrow in Lynn Ames, All That Lies Within proves that actresses can be much more than just a pretty face. Not yet released but read by everyone I know and thought of fondly, Ingrid Diaz’s The Blind Side of Love. A second draft of a not yet published romance novel The Blind Side of Love, about love between an artist Kristina Milano and a famous actress Julianne Franqui. A sweet romance we all hope the author will one day publish. Sweet! More books to add to my wish list! Thanks Canuckeh! And thanks for reading! And Playing the Role of Herself by K E Lane is a good one. The relationship is very realistic. There’s a good dose of humor thrown in. And I was just lucky enough to win a new one from Bold Strokes Books called, Starstruck by Lesley Davis. It sounds like a great book. Really looking forward to tearing into it and the ones you listed in your blog too. We need more hours in the day.